How do they go together? It's simple! After peeling the wrappers off all those broken crayons, grate them over a piece of paper. I prefer a lightweight, non-textured cardstock, but just about any type of paper will work. Depending on the look you want, you can use a variety of colors with either heavy or light coverage. When you are happy with how the shavings look on your paper, cover it gently with wax paper and iron on the lowest setting. You will be able to see through the wax paper to know when all the shavings are melted. Remove the wax paper and your new paper is ready to use! If you decide you want a heavier application of color, simply grate more crayons on the paper and iron it again. I should mention that my mini-grater lives permanently in my craft room. It is very difficult to completely clean the crayon off the grater. Fortunately, it is easy to find very inexpensive mini-graters at kitchen stores. Trevor and I made these cute tags for our Christmas gifts. 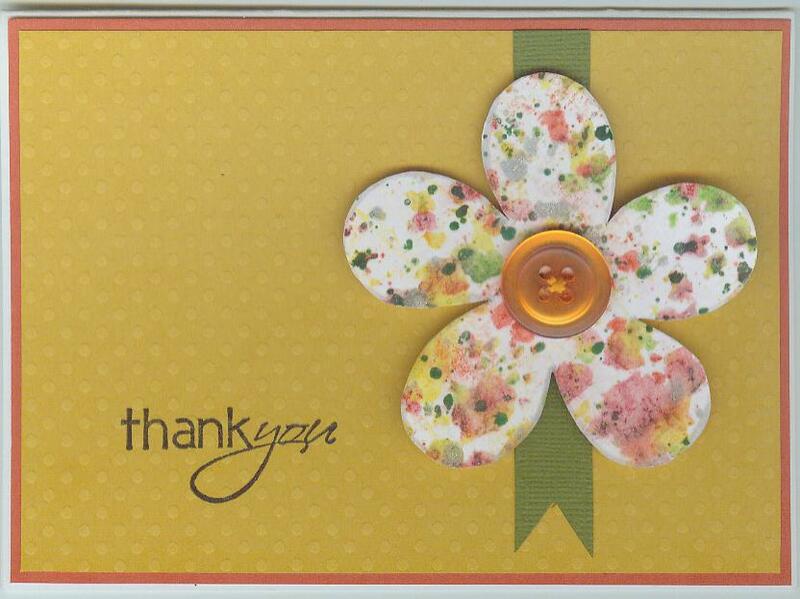 I cut a simple flower from my crayon melt paper to make a thank-you card. This is a quick bookmark I made to put on a Valentine's gift. You could use this crayon melt technique for accents, embellishments or even whole sheets of paper. Because crayons are acid-free, this paper is safe to use on your layouts as well. Experiment and have fun! Of course I knew that all the big names in the scrapbook industry would be at CHA, but it didn't really sink in until I saw them for myself. It seemed like everywhere I turned, there was someone I recognized from magazines or blogs... I even saw a few TV stars! The great debate when recognizing a celebrity is whether to interrupt them and gush, or whether to leave them alone and gawk from a distance. I'd say I was about 50/50! I saw Tim Holtz a handful of times, but he was always busy talking to the huge flock of women following him around, so I never actually met him. Same with Jennifer McGuire- I saw her at least 5 times, but wasn't able to find a way to meet her without interrupting. I was in the Technique Tuesday booth when the entire CK Dream Team came in for a meeting. They were clearly working and it would have been incredibly inappropriate for me to bother them. I saw Noell and Izzy Hyman from Paperclipping numerous times, but they were always recording when I saw them. And so it went for another dozen or so scrap celebrities. So who did I meet? Here are a few of my favorites. Kelly was alone in the Studio Calico booth, so of course we went right up to her to tell her how fabulous she is! Amanda and I both follow her blog and love her work. She was just as sweet and friendly in person as she seems on the blog. She is totally down-to-earth and had all the time in the world to chat with us. I don't know how to sew and know absolutely nothing about fashion (which I don't need to tell those of you who have ever seen me), but I LOVE Project Runway. I've watched all the seasons. When I saw Suede sitting at a booth in the sewing section of CHA, I had to go over and gush. He was there promoting his new line of dress patterns that Simplicity has picked up. His concept is great. Each pattern comes with variations so that the same garment can be made for three different types of women- classic, flirty or edgy. We each got an autographed pattern from him. Just like Kelly Purkey, Suede had all the time in the world to talk with us and was completely awesome. If you don't subscribe to Scrapbook Update and listen to the Paperclipping Roundtable, please stop reading (temporarily!) and immediately go and do both. OK, now that you're back.... let me tell you about Nancy Nally. I saw her in the October Afternoon booth talking with the owner and I zipped right over. I hovered while they talked. When they finished, Nancy started to walk away, thinking I was there to talk with the vendor. I stopped her and introduced myself. She was so nice! We stood there talking for 15 minutes- I heard all about her troubles with her hotel reservations (she was upgraded to a suite because of the problems), what she was enjoying at CHA (everything) and how glad she was that she was sporting comfy shoes (Aerosoles). It turned out that she was rooming with two of my Fiskateer friends, Betsy Burnett and Merlene Brockway. What a nice surprise! I used to love Mark Montano on "While You Were Out." When I heard that he'd be at the Fiskars booth signing 1000 copies of his new book ("Pulp Fiction"), I put that on my schedule as a must-do! Amanda and I hustled out of our class to try to be among the first in line. Success! We were number 2 and 3. Like the others, Mark was so nice and completely awesome. He was just as funny and cute as on TV. He personalized his autographs and posed for countless pictures. He is a huge fan of Fiskars and does lots of events with them, so I was thrilled to see for myself that all the good things the Fiskateers have said about him are true. For years, I've known and loved Tombow for their adhesives. I had no idea they make pens! In this class, Amanda and I learned all about the new Duel Brush Pen sets. Each pack has 9 gorgeous colors and one blender pen. We got to work with the set called "Jewel." Marie taught us how to make a splash background, add rich color to white Primas, use a blending palette, create two-tone pen strokes, and much more. The class was wonderful. She is a great instructor and I left inspired to play and experiment. Expect to see more from me in the future using these great pens! Here are some peeks at part of what we did! Long story short, Amanda had a ticket to this class, but Julie and I had to wait in a stand-by area in hopes of getting in. Eventually we did get in, but we missed the first half hour of a two hour class. The classes at CHA are fast paced, as most attendees are very experienced crafters, so missing 1/4 of the class means that it is nearly impossible to catch up. After struggling for awhile, I decided to abandon hope of following along and instead use the materials in my own way. I'm so glad I did, as I absolutely love my finished album! While Amanda was busy meeting with vendors and crunching numbers over the phone with Suzanne and Susan, I got to play with ink and stamps and paint! Doesn't sound fair, does it?! This class was incredible. While I've been stamping for years, I don't really know what I'm doing, so it was great to take a class from such a fantastic teacher. We worked with the most adorable stamp set featuring fruit. (See, I told you fruit was trendy this year!) I will be using this stamp set over and over. Isn't it cute?! Although not nearly as fun as playing with scrappy goodness, I did enjoy this lecture and am glad I went. Sandy is the Vice President of the Craft and Hobby Association and obviously knows the industry inside and out. Since I have no experience with retail or marketing, I learned lots of new things. Sandy's talk sparked some ideas that I passed along to the Flamingo Scraps ladies! All weekend I had to answer Amanda's phone, navigate, and send texts while she was driving. She was clearly surprised that I had no idea how to do any of those! If you ask anyone they'll tell you that I'm a technological dinosaur. So the fact that I attended something called Advanced Social Media is pretty funny. But I have to say that these instructors were incredible! They were so inspirational, so informative, and so helpful. It was clear that I was not the only one in the room who struggles with the latest technological advances. They really pinpointed why and how social media is so important in the scrapbook industry. Fortunately for Flamingo Scraps, Amanda is awesome and already doing 90% of what they recommended! After staying up past 1:00 AM for four nights in a row blogging, networking, and debriefing, Amanda and I were a bit bummed to have to leave Evelyn's house before 6:00 AM in order to fight the LA traffic to attend a 7:00 AM class. Fortunately, the class was great and well worth the lost sleep. Pat was an outstanding teacher and the project was really fun. I've done glass etching once before (I'll blog about that some other time), but this was Amanda's first time doing glass etching. I had no idea how Pat was going to work glass etching into scrapbooking, but the finished album is absolutely adorable. Check it out! The bride and groom are etched on a small glass mirror. I'm so glad that I got to attend these classes. It was an invaluable part of the CHA experience. I'm so inspired to retreat to the craft room and create!